What is the best location for my pond? 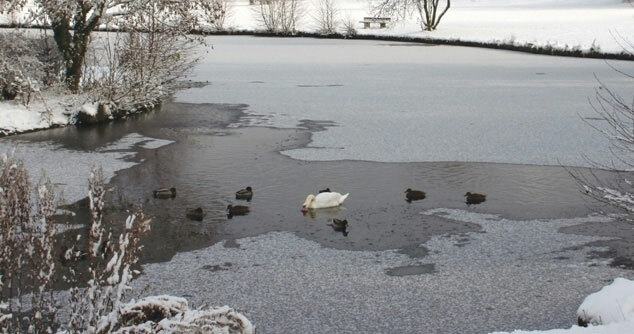 Your pond should be located in a spot where it can be enjoyed the most. Locating the pond near a window or alongside a deck will allow you to enjoy the pond more than if the pond was located out in the middle of the yard. Ponds should not be located in the low spots of your yard. These low spots gather rainwater runoff, something you do not want in your pond. Most books will tell you ponds need at least four to six hours of sunlight per day for proper plant growth. While aquatic plants (lilies, cattails, etc.) prefer sunlight, they will do just fine in shady areas as long as slow release aquatic fertilizer tablets are added a couple of times per year. Shady ponds tend to have less algae problems. Do not build a pond too close to a tree. Building a pond inside a tree’s “drip zone” can damage tree roots. Tree roots will not grow through or puncture a pond liner. A pond is not complete without landscaping. Locate your pond so there is ample room to landscape around it. It will take some time after your pond is installed for the plants to fill in and complete the setting. 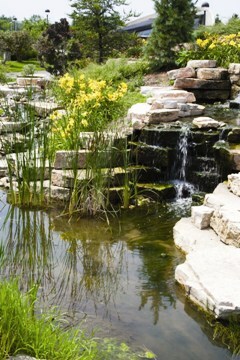 A waterfall and/or stream should be located at the back of the pond. This will allow you to see the water feature as you approach the pond, as well as increase the sound of the splashing water. What can EasyPro do for me? What should I know before installing a waterfall? What sort of filtration is required? What do I need to know about pond liners? How can I benefit from building a reservoir? Can’t find what you’re looking for? Submit a question! See our Learn section for articles, guides, tips, and tricks!